The residents of Ngarama Sub County in county of Bukanga, Isingiro District positioned in the south west of Uganda where various travelers tend to undertake Uganda safari tours have experienced moments of fear after being invaded by a lion, one of the famous Uganda safari attractions. The villagers got frightening incident in the wee morning hours of Monday when the lion attacked and injured Coleb Baryahika, Kamwesigye Banturaki and George Faara the residents of Kabengo, Kamutinda and Burungamno villages some of which remained with broken limbs. This tragic incident set the community on fire prompting them to work hand in hand to contain the lion until the Uganda Wildlife Authority (UWA) officials which is responsible for management of national parks normally encountered on Uganda safaris and tours arrive in the area to handle the problem animal. The UWA management at Lake Mburo National Park hastily dispatched to contain the animal and take it back to Queen Elizabeth National Park – the most visited park by travellers in Uganda safaris where the lion is believed to have strayed from. The issues of problem animals continue to rise including the Hyena case in Lake Mburo National Park that attacked Rwagemu in broad day light taking his two arms culminating into his death. 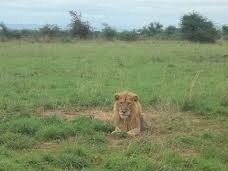 Other cases of stray lions have been reported in Kasese in the north of Queen Elizabeth National Park.